“Bangkok Sunset Ride” is a very gentle 4 to 4,5 hours culinary and cultural bicycle ride through Bangkok’s Thonburi side. Bangkok Sunset Ride starts from the Royal Orchid Sheraton hotel at 17:30 hrs. After a quick bike fitting, we’re on the way to the first river crossing that brings us to the Thonburi side of Bangkok. Together with our bicycle we walk across the Klongsan market. From here we cycle in a relaxed pace to a Chinese pagoda located on the riverbanks of the Chao Praya River. The inside of the 8 stories pagoda is finished in granite and bronze. The windows have delicate etched designs of birds and other animals. We continue the Bangkok Sunset ride through a quiet neighborhood and stop at the second market. Here they only sell food and is the place where we’ll have our “starter” tonight. There are so many food stalls and our guide will explain to you what is offered, how it is cooked, and what’s in it… We’re sure you’ll enjoy. We continue along the river until our stop at the Temple of Dawn. It’s almost magical the way Wat Arun is lightened and gives you a new impression. Now it’s time for our main dish and we will sit down at a typical local Thai restaurant. After we finished our meal we cycle along Wat Rakhang Khositaram to the pier where we will cross back to the Bangkok side. We ride along Sanam Luang and the Grand Palace until we reach Wat Pho for a visit and stroll the temple compound. 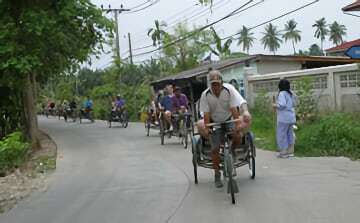 We continue the ride to “Pak Klong Talad” or Flower market. You’ll see a kaleidoscope of bright colors as vendors just receiving fresh floral goods from every corner of Thailand. The next stop we are back at the Sheraton where the Bangkok Sunset Ride ends and we have to say goodbye or transfer you back to your hotel. NOTE: Since you will visit an important Buddhist temple (Wat Pho), you are expected to dress respectfully. We recommend you to wear longer shorts (knees covered) and to have your shoulders covered when we enter the temple.